Eighty miles northeast of Chattanooga in Roane County lies Harriman, born out of the temperance movement and subsequently known as the "Prohibition City of the Nation." The title to each deed in Harriman had a clause "prohibiting the making, using, handling, storing or selling of intoxicating liquors." Violation could lead to a revocation of title. The town's official seal bore the motto "Prohibition, Peace and Prosperity." Harriman, named for Walter Harriman, a Union officer and later governor of New Hampshire, was founded in 1889 as a planned community by East Tennessee Land Co. The goal was to attract industrial and economic development through mining and manufacturing operations while avoiding the vice-driven pitfalls of other late 19th-century company towns. The land company built a three-story building for its headquarters. Its striking brick and stone facade and four Norman towers cost $26,000. The structure was said to be the "finest private office building in the state." When the company failed during the Panic of 1893, the abandoned building became part of newly formed American Temperance University. Attracting non-drinking students throughout the country easily transported by several railroad systems, the school welcomed its first class — 250 students from 15 states — on Sept. 12, 1893. In 1907, the school reached its peak enrollment of 376 students from 20 states. The Honorable H.B. Case of Chattanooga was a lecturer in the law department. Frank Richy of Cleveland was a student in the preparatory school. Key City Book Store in Harriman, a branch of T.H. Payne and Co. of Chattanooga, was an authorized agent for Roane County textbooks and school supplies. The God-fearing citizens of Harriman enthusiastically welcomed the university. The building was renamed Greenlee Hall, honoring Mr. and Mrs. C.D. Greenlee of Pittsburgh, who contributed $30,000 to acquire it. Munyon Hall, another three-story building, served as a boarding house for male students. Female students were temporarily housed in the School of Domestic Science, which later became Bushrod Hall Bed & Breakfast. The citizens of Harriman provided a third building, with a gymnasium, thus satisfying the mandatory requirement for gymnasium exercise. The school was active in intramural and intercollegiate sports. Its teams played football against the University of Tennessee and Maryville College during its short life. Harriman lost to Maryville seven times and split 10 games with the University of Tennessee with its most lopsided loss to the Vols of 104-0 in 1905. That encounter yielded the highest point victory ever obtained by a UT team. In 1907, the squad defeated the University of Chattanooga by a score of 10-0. The faculty at the school's zenith had more than 20 instructors in six courses, a law school and a post-graduate studies program. A unique affiliation with three other institutions in the state at Greeneville, Powell's Valley and White Pine allowed students to take additional courses in pursuit of their degrees at American Temperance University. A four-year course of study was provided for students studying to be teachers. A preparatory school was created for freshman students deficient in Greek and Latin. Foremost in the school's commitment to prohibition was a requirement that each student upon enrolling take the following pledge: "I hereby promise upon my honor to conform to all the laws and regulations of the American Temperance University, now enforced, or which may be enacted by the proper authorities, while I remain a student of the institution and to yield respectful obedience to all its constituted authorities." After the American Temperance University closed in 1908, all of its properties were leased to The Mooney School, a preparatory institution. The Mooney School closed in 1912, after which the American Temperance University properties were obtained by the city of Harriman and used primarily as administrative offices. For a time the city jail was housed in the basement. 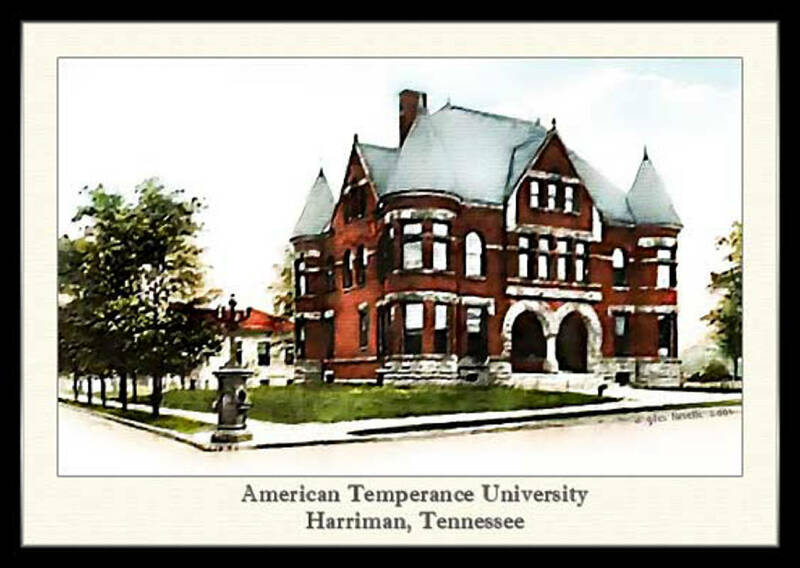 Although the American Temperance University was open for only 15 years, it provided quality education to its students. Among its graduates were two members of the U.S. House of Representatives, James Willis Taylor and John Jennings (both representing the Second District.). The university's surviving buildings have been taken over by Harriman and private interests to preserve the historical significance of this important component of the temperance movement. Jerry Summers is an attorney with Summers, Rodgers and Rufolo. Mike Demyanovich, who is a resident of Harriman, contributed to this article. For more visit Chattahistoricalassoc.org.